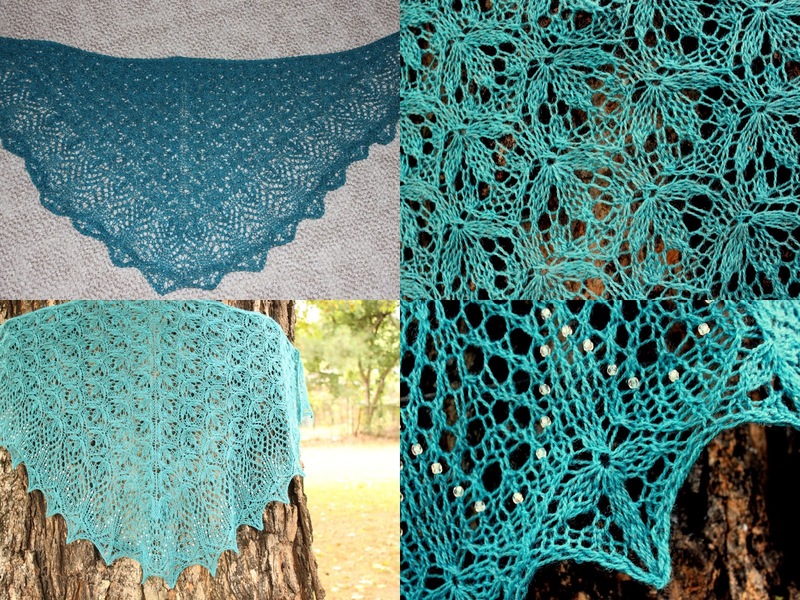 Well, the Rata Lace Scarf is returning to stash form. It's fine, really. I might give the pattern another go with different yarn sometime, but for now, it's best to just try to put it out of my mind. I'm not without lace on the needles though. 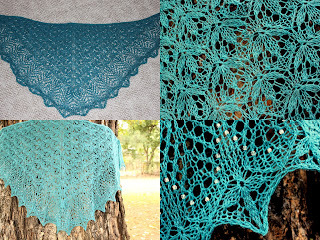 My secret lace project has over 200 stitches per row, but it doesn't feel like it. 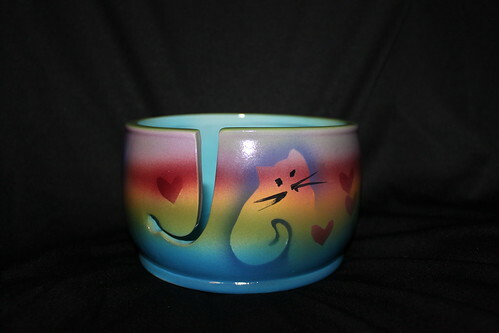 I think I am going to transfer the yarn to the yarn bowl, because it has probably become an at-home only project. In other not-news, I could not come up with a picture today. We'll try again tomorrow, eh? Why knit when you can look at patterns? Yeah, I have a new book, New Lace Knitting by Rosemary (Romi) Hill. Wendy reviewed and gave away a copy a while back. When I entered the drawing I decided that if I did not win, I would get it. I didn't, so I did. While I've only given it a quick scan, I see some patterns I think I would knit and even some I would keep and wear. I really like that there are sweater patterns written for lightweight yarns. 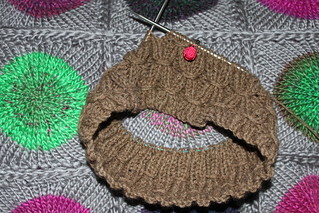 I am tempted to just knit a quick cowl or two, but I'm going to try to stick with what I have on the needles for now. 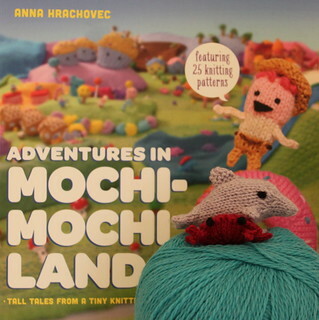 However, that doesn't mean I can't flip through the book and mentally go through the stash, pairing patterns and yarn. So, maybe FiSweMo? I'm not really thinking about a deadline or schedule for finishing, but I would like to find out if I have been knitting a sweater I will wear. Anyway, I'm a bit at loose ends with what to knit now. 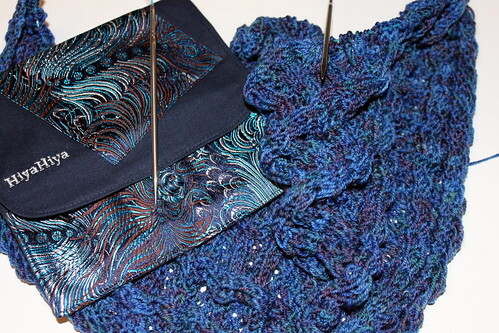 My focus is a bit off, so I figure I can spend a bit of time with my Featherweight Wrap to Knit for now. 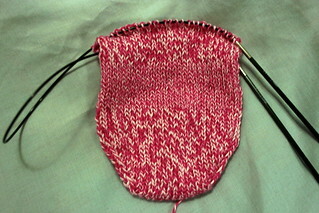 It is in a long-row stockinette state, so it seems like a good choice for what to work on for now. So, no NaKniSweMo, and not even the pressure of FiSweMo, but maybe just KniThiSweSoMo. And now, because the big brown blob of a sweater is even less photogenic than the last time I showed it, I'll show you a picture I took back in July outside a yarn store in North Carolina. Well, I did not look closely enough to determine whether there was a noticeable difference between the original yarn and the additional yarn for completing the piece. However, it took less than one repeat of the edging chart to see what I could not see before. You can see it, too, can't you? Somewhere in my brain, I must have known this to be true, as I had already been thinking of alternate plans for the yarn. While I am a little sad about this, this does free me up to pursue other projects. Still, I'm not quite sure. I might knit on this a little more before making a final decision. I had something on my wishlist that my younger brother said he wanted to get for me, but lamented that Amazon had let him down by not being able to get it to me in time. We'll just gloss over the fact that he waited until the last minute to figure out what to get for me. Fast-forward to yesterday, and I was in Costco and spotted the very thing in the store. When said younger brother called to wish me a happy birthday, I told him what I now had. He asked if I would be making him a Darth Vader for Christmas, and also if the book had a Chewbacca pattern. I asked him what he was getting me for Christmas. I received a lovely surprise birthday gift of yarn and the Fall issue of Interweave Knits. I have been smiling all day just thinking about the name of this colorway. I guess it all started with what I thought was an innocuous comment a couple of months ago. We were talking about upcoming family gatherings. What is something of a troublesome spot is whether to have the football game on the television or not. I fall firmly on the not side of things for many reasons. My birthday begins a cluster of birthdays (mine, a brother-in-law, a niece, a sister-in-law) that occur in the space of ten days, so we usually just have one party. Anyway, when I joked that there should be no football because it would also be my SuperSpeshulMagicPrincess40thBirthday, I accidentally set something in motion. 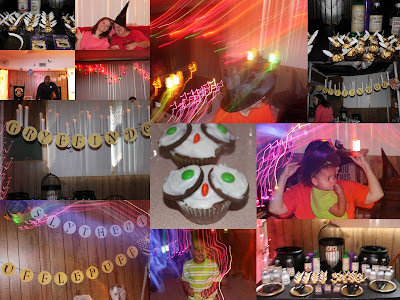 My birthday celebration became its own separate party, people decided the details should be a surprise for me, and it just kept growing, with secret Pinterest boards and everything, apparently. I only wish my photography skills were up to capturing the wonderful job they did. We had a great time, and I'm keeping the decorations up at least until the end of the week. Well, I think my lace plan can proceed. I just need to figure out where I was in the pattern. It is probably too much to hope that I took notes. From time to time I begin to form knitting plans that involve knitting many of one thing or something for several people. I do not always follow through with the plan. This is the start of one of those ideas. 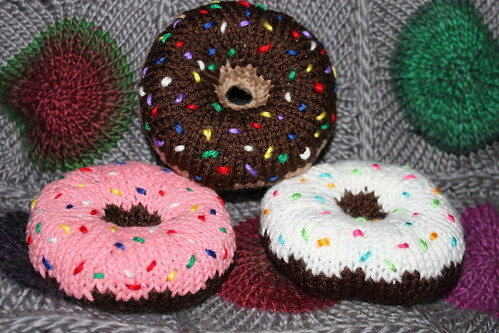 I'm not quite sure about it, but I probably need to knit at least one more or sleep before I think about deciding. Also, it isn't anything I need to figure out any time soon, so that relieves pressure, too. Choosing a gift for an in-law you do not live nearby or spend much time around can be a challenge. My birthday gift from my sister-in-law arrived, and she chose well. 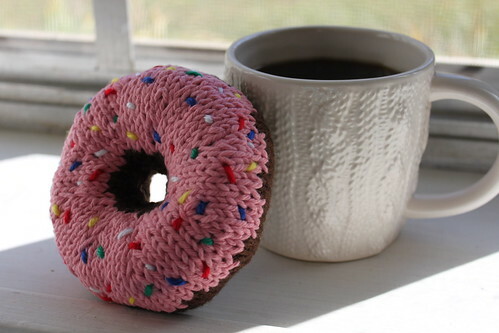 The replacement knit for the donuts may be here. What do you think about pigs with wigs? Our former neighbors called us a few days ago to alert me to an estate sale nearby they thought would interest me. 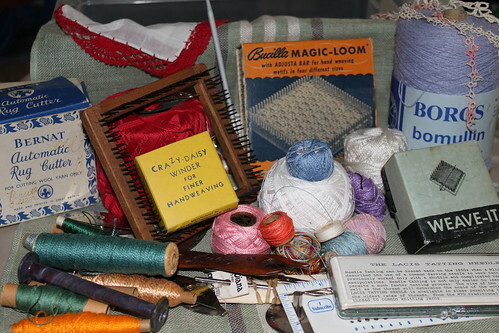 I could see some weaving looms and coned yarn in the photos, so I decided to have a look this morning. Some things I was interested in checking out were already gone. There was still an enormous Harrisville Designs million (or maybe just ten--counting is hard) treadle floor loom. Even if I thought I really wanted it, it is out of my budget and is enormous. I came across a binder of lesson plans for teaching weaving. I believe I spotted the name of someone I know in the class list from 20-25 years ago. I found several large boxes of loom waste. I chuckled to myself about that feeling of being unable to throw away yarn like that, knowing it is useless but convincing yourself it is good and you will figure out something for it. I don't think anyone else knew what I was talking about, but I was able to identify what they had in those boxes. I saw a bee smoker, at least five children's sewing machines, and the same bathtub toy kayak my older brother used to own. So, with such bountiful treasures, you're probably wondering how I got it all home, eh? Well, I managed to limit my purchases to a few things that fit in a Rubbermaid shoebox. I think I found a few useful treasures. I just can't seem to help myself. Before I had finished the first donut I had already started to think about the next one. By the time I cast on for the second, I already had plans for the third. The most challenging part of making these is stuffing them. It takes a lot more fluff than I would have guessed. I'm sure something else will capture my attention long before I knit a dozen, but for now, I am having fun. Nobody tells me anything. How many times have we thought or heard that? I find myself in a bit of a pile of that lately. However, I am not really bothered by it. If I need to know, I will find out eventually, and if people need for me to know sooner, it is their responsibility to tell me. Truly, though, it is not about me, and there are good reasons why I am not always in the loop. For example, sometimes there are secret plans for parties. My sister has had a growing need to transform our very informal family gatherings into something more elaborate, and she has taken my upcoming birthday as the perfect opportunity to charge full speed ahead. 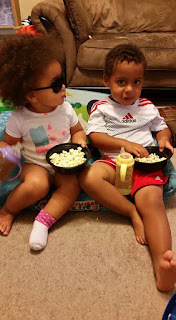 Nevermind that she is recovering from surgery, feeling tremendous stress in most areas of life, and now warring with her partner in crime for the party. No let's just forget about that. 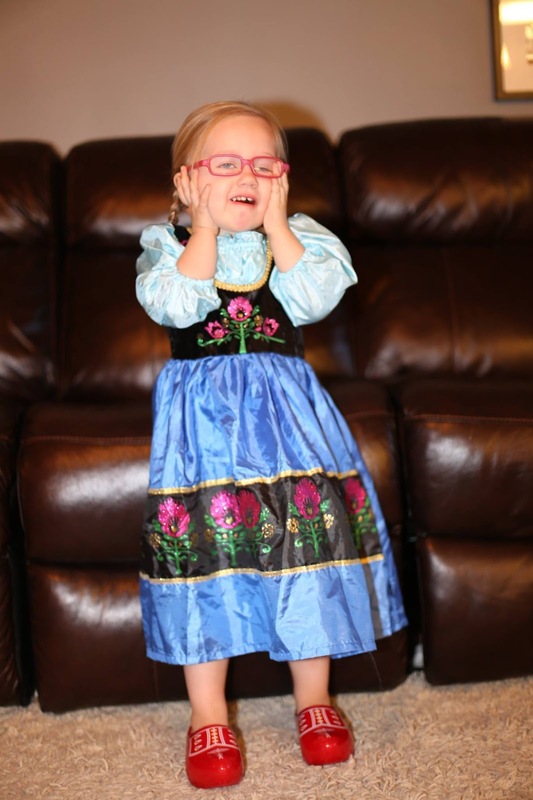 All I need to know is that she requires I vacate my home four hours prior to the festivities. She needs me to come to her house to watch her children. 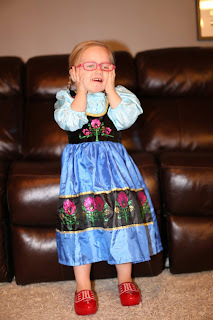 During this time we are to somehow persuade the toddlers to take naps. But really, what does she have planned that takes four hours? I might be a little scared. At least I have knitting to calm myself. And that brings up another reason for secrecy. 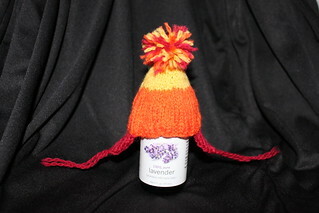 I am going to be working on a little bit of sooper-seekrit knitting. 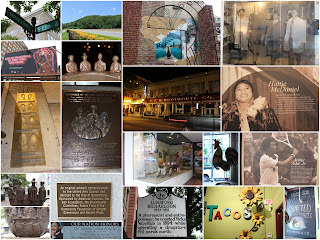 Operating this enormously popular blog means that I must assume that the recipients of these planned projects are reading this and every entry, and therefore, I must keep quiet about the progress. 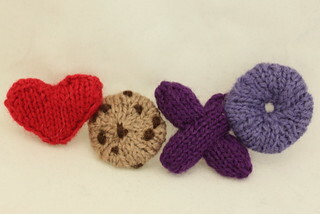 So, here you go, some yarn that will be part of one of the gifts. We'll all just have to endure the mystery and intrigue for a bit. 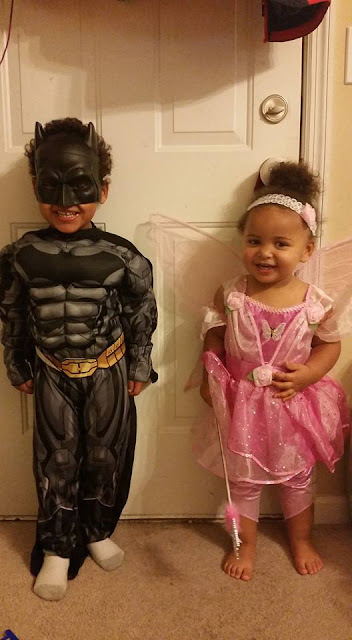 I make no promises not to hint at or blog vaguely about them, but it isn't like I have actual blogging plans. Shocking, I know. Knitting this would have been much faster if I hadn't had so much help. I wish I could have captured a photo of my nephew helping me with the process. He was lying on the couch next to me with his legs in the air and the yarn running between his toes. To his credit, he did not create a tangled mess, only a small mess. Well, I am still not quite sure what I will do with this, but learning something new is always good. Today I was amazingly productive. I even managed to locate the pencil box of dpns. In case you were curious, they were in a box that I walked past countless times. Anyway, most of my productivity is particularly boring, but it is a good feeling to have those things out of the way. It let me relax and enjoy knitting time, and allowed me to be productive with that, too. I finished my qiviut cowl. I think I like it. It is still drying, but I can already tell that its dip in the bath made a difference. Knitting with the yarn did not impress me much. It was not unpleasant, but just did not seem very special. It already feels softer and squishier, but I will have to wait for it to dry to know more. 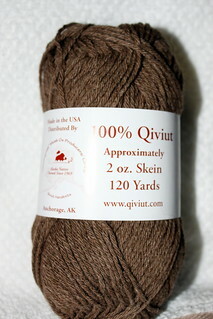 The general consensus for the qiviut yarn was a cowl, so next it was over to Rav to choose a pattern. After a time, I finally settled on a pattern called Ziyal, and has smocked stitches. I think this works, and hope my Monday allows me the time to finish it. Once upon a time, maybe about six months ago, there was a bit of enabling. I saw an interesting Kickstarter campaign, was feeling rather lousy, a bit of encouragement from Bruce, and then I promptly forgot about it until summer when there was a project update. Still, the incentive was not to arrive for a bit, so it flitted back out of my brain. Then, the updates were more frequent, and soon the shipping had begun. I checked in on the Rav group to read first impressions and troubleshooting. I began to get a little excited, but mine was to be in the last shipment. Then life got in the way, but I look forward to getting to know my Electric Eel Wheel. I have spent a little bit of time trying it out, but there might need to be a bit of sanding here and there. Getting right with the tension might take some time. Reading what other people have found helpful has been good. I just need to spend some time working on it and with it. This evening it became even more apparent to me that I need to spend some time working in the craft room. I wasted way too much time trying to locate my pencil box of dpns, and never achieved success. I thought picking out the yarn was going to be the tough part, but I was wrong. Eventually I decided to give up the search for the night because I just kept retracing my steps. For a brief moment I tried to think of someone to blame for my predicament, but I am the only person to go in that room. I still think there is a good chance that the box is hiding in plain sight, but that is really just more reason to walk away for now. 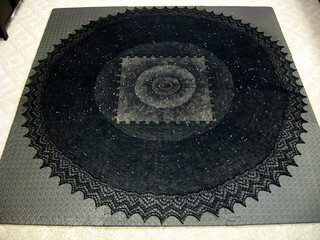 Well, I am still waiting to see if my lace plans will work, so I do not want to start anything big. 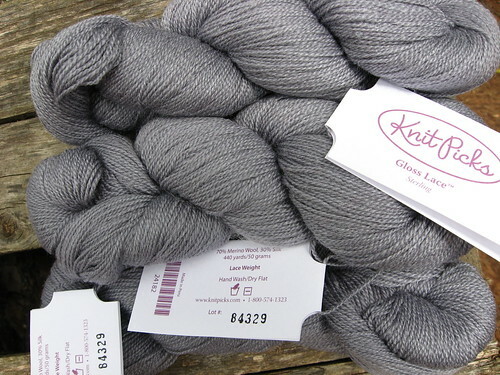 I came across a special skein of yarn, and now I am trying to figure out which pattern to knit. This is the prize my mom brought back for me from her Big Alaskan Adventure. I am thinking cowl or mitts, but I haven't figured anything out yet. Sometimes, even though it's only a tiny crescent moon, the best thing to do is throw back your head and howl. 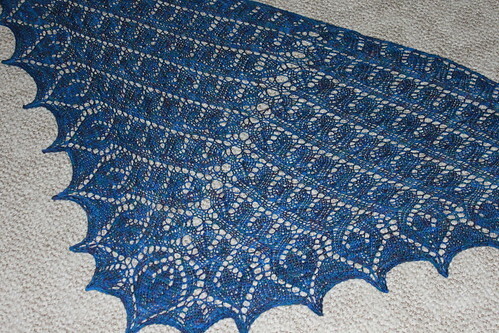 Once again, I have finished a shawl, and it feels like a success. Why do I take breaks from lace? 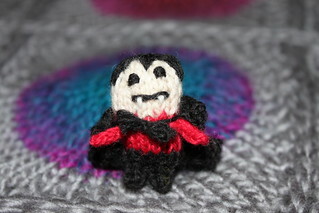 Vlad is a nice, easy knit. I may have plans for my next lace already, but there is a bit of an obstacle in the way. I will try and take care of it soon, and hope it works. I know you're all waiting anxiously. I hope you're sitting down for this. I managed to get this in the post already. I did not procrastinate with hopes of getting better photos. I did not agonize over writing the right note to accompany it. You know, getting the note right is what holds up many of my packages and emails. I try to get it just perfect and become overwhelmed. It is a bit ridiculous, and I am not very successful in my battles against it. Anyway, I just jotted down a quick note, packaged it up, and got it out to the post office when I went out on cat duty today. And while I'm on a roll letting you know how impressive I am, I'll just tell you that I also got Springtime Bandit packaged up and sent on its way, too. So, I am hoping for doing as little as possible tomorrow. I think we may have been rolled over by a tsunami of rude and selfish, but we are trying to give the benefit of the doubt and call it a series of clueless folks with poor communication skills. We're just not up for translating it. Let's just spread a big round of Bless Their Hearts all around. I know you were starting to think that it was going to be all knitting all the time around here. Whaddya say we change it up a bit? I bought a walking stick. It has a light and a compass and is purple. I'm getting a FitBit for my birthday later this month, so that and my new stick mean I will totally be taking walks all of the time, right? The rain is falling, and so is Bruce's blood sugar. It's a bit weird, but I suppose with everything else going on, it is not surprising that this is a bit wonky, too. It does make things a bit more challenging. He is using the electric carts in the stores so that he can handle being up and about for longer and go where he would like and it helps him to get it a bit more walking from going out on errands with me. That is good, except for the part where he found a mimosa tree on clearance and it became the only thing he ever wanted. So, I planted a tree today. The next 36 hours or so look to be fuller than I would like. Next time we're in the hospital, we both ought to have checks to see where your backbones have gone. Yeah, I'm willing to take part of the responsibility, but I will also say that other people could be more considerate, too. I need to watch out because I am in danger of popping off at the next person who annoys me. I think it is time to sit with the quiet and some relaxing essential oils and just breathe. Never mind, I bought ice cream. I will take time to take care of myself some other time. 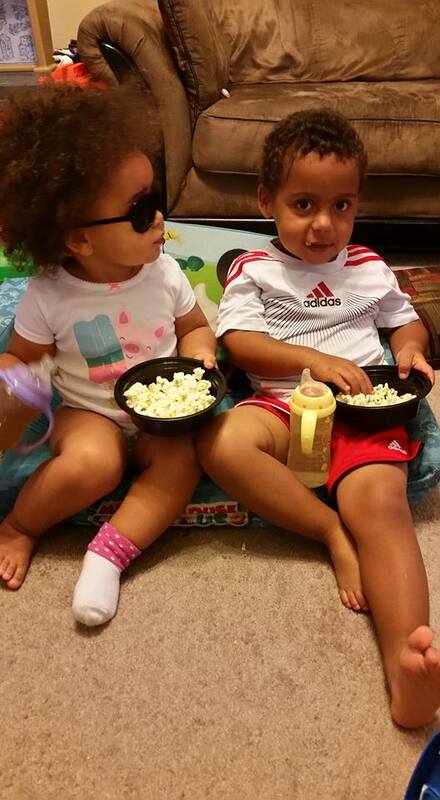 Really, I just need to spend some time chilling like these two. What can I say? Today was a day filled with laundry. I was a bit strategic with it to minimize the need to fold clothes and maximize the number of loads completed. I will probably finish my night trying to stream something on Netflix while pairing socks and folding towels. I did manage to get rid of a piece of drama furniture. It is good to have it gone, as it was trouble from the start. It was one of those things where different expectations could not quite come into alignment. I hope to have its replacement soon, and that the drama can just be done. It wasn't all fun and games around here. I did manage to spend some time knitting. 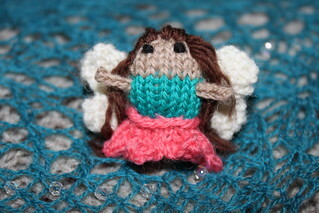 So, here she is, a tiny fairy to bring you peace in your new week. Vlad is finished and after a nice soak, it will enjoy its time being pinned out on the blocking squares. Perhaps it will get its picture taken tomorrow. A photo shoot is certainly more appealing than housework. Of course, I might do well with some extra resting tomorrow. Today was a bit of work out in the yard and on the exterior of the house. You're jealous, I know. I have hopes that this will be a quiet week. I'll be checking in on and caring for my cat-nephew, or nephew-cat if you prefer. Or you could just say that my older brother is heading out of town for fun and excitement, and because I have no discernible life, I will be looking in on his cat. I don't mind. The cat is deaf and old, and possibly not very bright, but he is nice. Well, after this week, I needed to do something to shake it off a bit. I wasn't coming up with the right answer until I received an email announcement of some new patterns. After that, I knew what I needed to do. We are so glad to be home. Now to settle in for some sleep, and then maybe some boring normal. A new stent in an old graft was today's adventure. My sister is feeling well enough to be grumpy (yeah, she has been in the hospital this week, too) with people. We have a gremlin in our call button that randomly sends a help request to the nurse, the tech, or even the kitchen. Maintenance has been by a couple of times. We are all keeping a good sense of humor about it. We have good reason to hope that we will go home tomorrow. Access to the innerwebs remains spotty. Yeah, that hospital wi-fi I was wondering about yesterday? Not so much. Some error banned access for everyone, and after that, it has just been slo-o-ow. While our current adventure is important and consuming for us, telling others is all rather boring, as most medical things are, and we have another day of it tomorrow. I thought I was going to make it back to the house today, but that didn't happen. Maybe we'll get better information tomorrow that will give us some answers. Maybe not. So, no picture for today. You can picture an almost completed Vlad, if you would like. I managed a few rows. I'm on the last charts. Not every Monday can be a favorite. We are fine, even though this isn't how we wanted to spend our time. Maybe we'll see how the wi-fi is flowing tomorrow. I think it will be another day of waiting, but this time in an area where I can bring some knitting. I promise I did finish this yarn, and during the Tour, even, but I just haven't gotten a picture of it. Let's see if the promised sunshine of this week makes a difference, eh? You know how it goes. 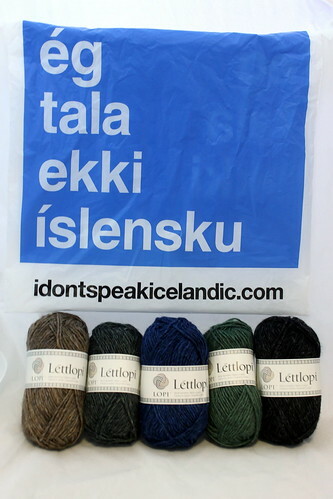 Your brother vacations in Iceland, he brings you back some yarn, and then he notes with surprise that those are his colors. Well, I did have a ridiculous idea to make something for everyone for Christmas. 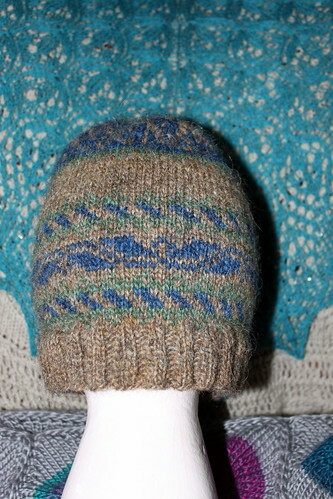 Something about an Icelandic cat of legend, but before I was working the decreases on the first hat, I was over that. Anyway, I used the charts from the North Iceland Mittens pattern in Folk Mittens and made this hat for my brother and gave it to him for his birthday today. It fits, and it even matched the outfit he was wearing. He declared that it would be the hat to accompany him on his journey to Maine this week. Well, once I finished the last shawl, it was time to knit another. I wanted to get back to knitting for the friend I was originally knitting for when my plans changed. So, once again, I went to the stash. I really wanted to knit with my Knit Picks Aloft because it felt so lovely, and the color seemed perfect. 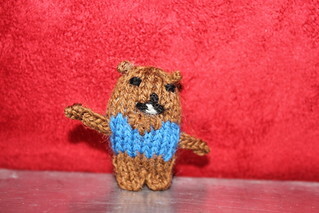 However, I have never knit for this person before, and I am not always sure about mohair content for the uninitiated. I finally decided on some Dream in Color Smooshy in Night Watch. 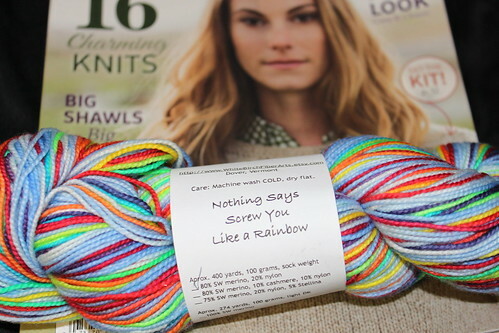 It was a special skein that had been waiting for the right time, and this plus the colors convinced me that this was the yarn for this shawl. After that I was searching through Ravelry once again for patterns. I narrowed it down to two, and then to one--Vlad. The knitting has been wonderful. The yarn is so nice and squooshy. The stitches are flowing, and I am making great progress. My new early birthday present is adding to the enjoyment, too. Brucie bought me this lovely HiyaHiya Sharp Interchangeables. We're also enjoying a delightful change in the weather, and with a little bit of streaming some quality television/movies I should be done soon. There was a plan to knit a shawl for someone. I went through the stash. I considered options, and finally it was the color that called to me. 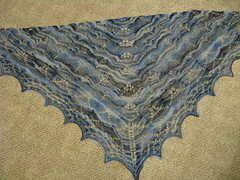 After that, I searched through patterns on Ravelry, and the pattern I settled on Echo Flowers Shawl. It had even been in my queue for a bit. I had not been knitting for very long before I realized that the shawl I was knitting should actually go to someone else. One evening I was knitting along and admiring the color, when my thoughts turned to my cousin. She is getting married next month, and one of her colors for her wedding is teal. From that moment, I knew that this shawl was meant for her. 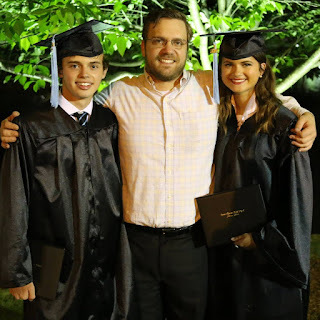 So, I knit on, thinking good things for her and her wedding and this new chapter in her life. 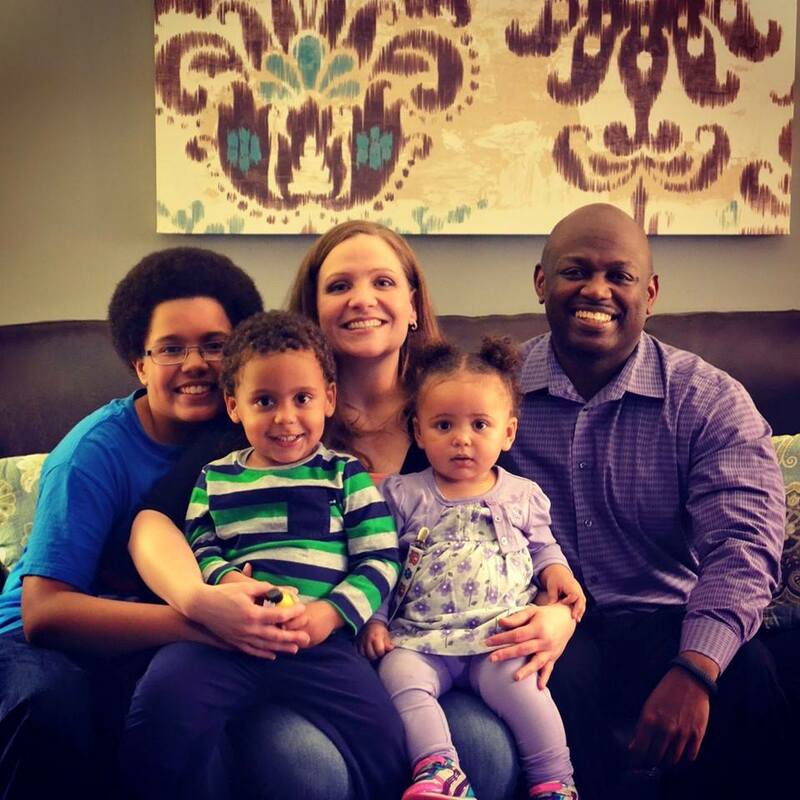 My cousin has had a different and challenging life, and I have such hopes for her. It is her turn for some good things. Anyway, back to the knitting. When it came time for the nupps, I decided to substitute beads, and I am really pleased with the decision for a couple of reasons. First, it looks so lovely. I used the leftover beads from my Celestarium. 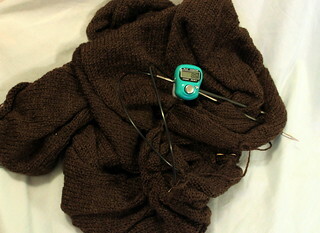 Second, when I finished binding off, I guessed that I would have run short if I had worked the nupps. I only had a little bit of yarn left, and if I had worked the nupps, I might have run short. So, it would seem it was the right decision. Of course, once the shawl was off the needles, I was concerned that it would be a bit small, but it blocked out beautifully, and I feel like it is a nice size. Now I just need to get an address, and then get it in the post. Happy Groundhog Day! Yeah, so that was yesterday, but considering how far out of everything I have been, one day late is practically early around here. Anyway, my enjoyment of Groundhog Day is ignored tolerated legendary, and people look to The Groundhog and the stars for predictions of the future, so it seems like the time is right to show this. Yep, I completed my Celestarium, and it is wonderful. I finished it last month, and then let it stay pinned out for a few days just to admire it. I haven't managed to get better pictures of it, but I am mostly ok with that. I have covered up with it, paraded around the house in it, and pulled it up over my head and snuggled up under it. 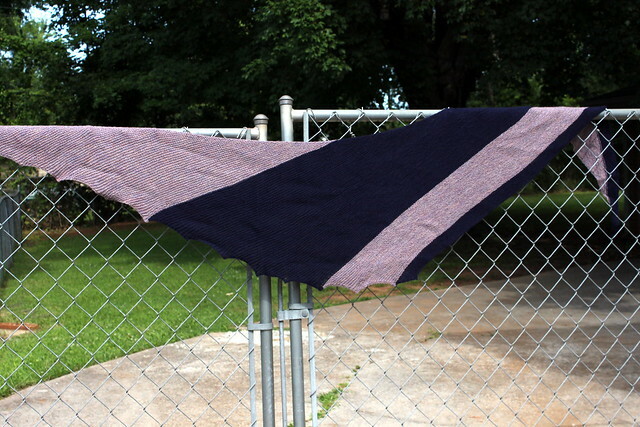 Now that it is done, I occasionally think about knitting Southern Skies or Equatorial Nights. Maybe I will, but not today. So, as we look to the stars and The Groundhog, do we have any answers? I kind of doubt it. Do I have any predictions? Nah. I might have a few guesses, but certainty is not really happening here right now. Maybe I will ease into things with a few posts sharing a bit about what I have done over the last few months. I will probably pop in with some comments here and there. I will knit.